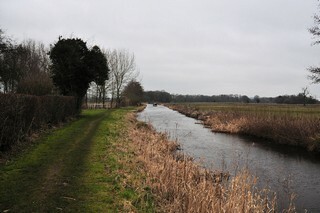 Looking to the North-East, the Montgomery Canal to the South-West of Heath Houses Bridge No.74. Les regards portés vers le Nord-est, le Canal de Montgomery au Sud-ouest du Pont n°74 d'Heath Houses. 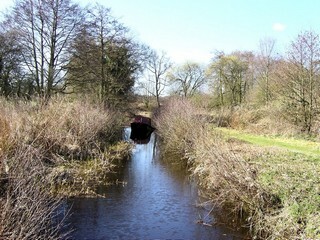 Heath Houses Bridge No.74 seen from the South-West. Le Pont n°74 d'Heath Houses vu du Sud-ouest. 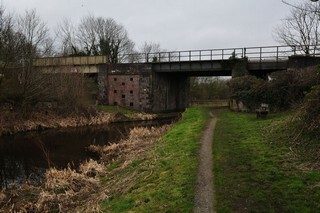 Heath Houses Bridge No.74 seen from the North-East. This building was used as the terminal building, transfer station for passengers who came by rail from either Birkenhead/Liverpool to the North-East or London or other places to the South-West from about 1850. The railway station, Rednal, is just a short distance away. Those people wishing to travel at that time to Newtown could catch a passenger boat - scheduled - and it would take about six hours to get to Newtown. 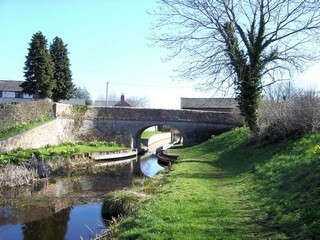 Le Pont n°74 de Heath Houses vu du Nord-est. Le bâtiment était une gare de correspondance pour les passagers qui vers 1850 venaient en train soit de Liverpool/Birkenhead au Nord-est, soit de Londres ou d'autres villes au Sud-ouest. La gare de chemin de fer de Rednal est toute proche. A cette époque, les voyageurs qui souhaitaient poursuivre leur séjour vers Villeneuve (Newtown) pouvait prendre un bateau régulier qui en 6 heures de temps les auraient conduits à Villeneuve. 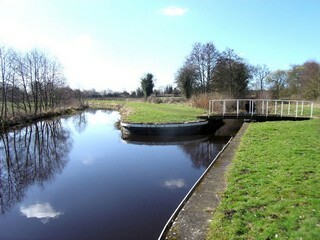 Looking to the South-West, the Montgomery Canal seen from Heath Houses Bridge No.74. 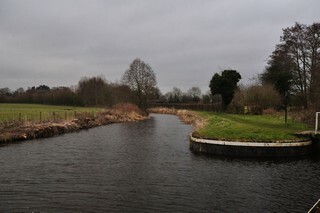 Les regards portés vers le Sud-ouest, le Canal de Montgomery vu du Pont n°74 d'Heath Houses. 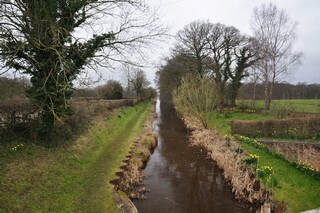 Looking to the North-East, the Montgomery Canal seen from Heath Houses Bridge No.74. 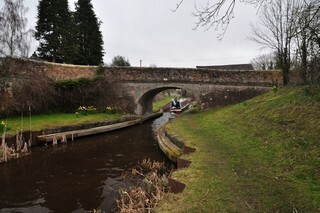 At the back, Rednal Railway Bridge No.73A. 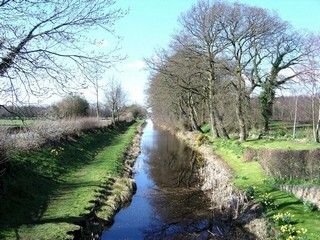 Les regards portés vers le Nord-est, le Canal de Montgomery vu du Pont n°74 d'Heath Houses. À l'arrière, le Pont Ferroviaire n°73A de Rednal. 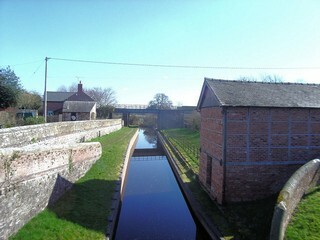 Looking to the South-West, the Montgomery Canal seen from below Heath Houses Bridge No.74. 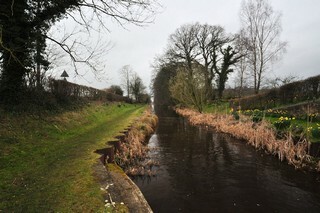 Les regards portés vers le Sud-ouest, le Canal de Montgomery vu de par-dessous du Pont n°74 d'Heath Houses. Heath Houses Bridge No.74 and Rednal Railway Bridge No.73A seen by Google Earth. Le Pont n°74 d'Heath Houses et le Pont Ferroviaire n°73A de Rednal vus par Google Earth. 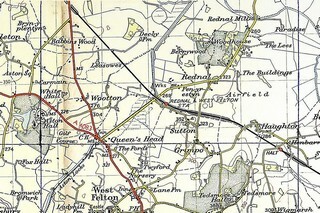 Old Ordnance Survey Map showing Rednal Railway Bridge No.73A. Ancienne carte topographique montrant le Pont Ferroviaire n°73A de Rednal. 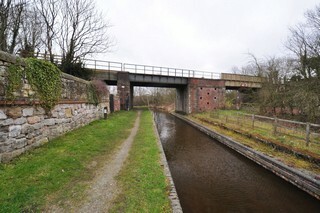 Rednal Railway Bridge No.73A seen from the South-West. Le Pont Ferroviaire n°73A de Rednal vu du Sud-ouest. Rednal Railway Bridge No.73A seen from the North-East. Le Pont Ferroviaire n°73A de Rednal vu du Nord-est. 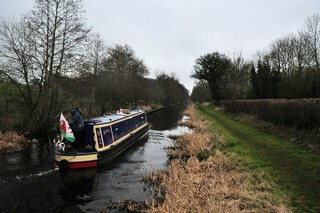 Looking to the North, the Montgomery Canal to the North-East of Rednal Railway Bridge No.73A. 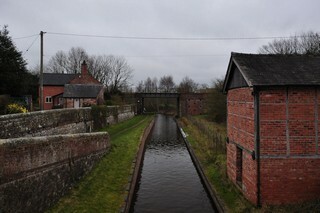 Les regards portés vers le Nord, le Canal de Montgomery au Nord-est du Pont Ferroviaire n°73A de Rednal. 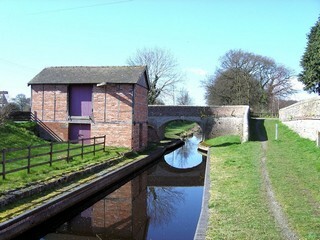 Looking to the South, the Montgomery Canal to the North-East of Rednal Railway Bridge No.73A. 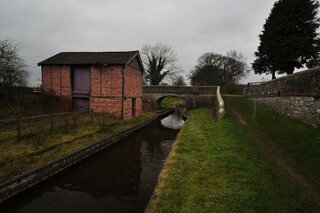 Les regards portés vers le Sud, le Canal de Montgomery au Nord-est du Pont Ferroviaire n°73A de Rednal. 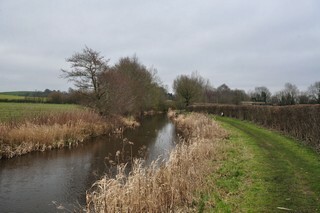 Looking to the South, the Montgomery Canal to the North-East of Rednal Railway Bridge No.73A. To the right Rednal Basin. Les regards portés vers le Sud, le Canal de Montgomery au Nord-est du Pont Ferroviaire n°73A de Rednal. À droite, le Bassin Redal.